Personaly I do not know how I feel about it. Where will the labels be put up? I thought if they were going to be saved they were going to be saved on this website, not another website. I would need a bit more info on this, can you please explain where they are going? On piece #1, CathyG posted a similar label on page 1 of this topic, but it doesnt have the "Lido" on top. DenCill also posted a similar label on page 4, and Anne E.B. posted a good description of where it came from at the bottom of that page. I think maybe "Lido" was for a particular maker that sold for George Hardy (importers?)? The #3 piece has a common Venetian Glass label, not a Seguso label. I think no 4 is a modern piece, but any idea if Murano? I have noticed a tendency as with my Moretti and some Nason not to put Murano on the 'label', the stemmed vase is of course not of that calibre. I wonder if that square gold label is an importer label or a company one, if it was anything good I am sure the label would have the maker name on with logo etc. I have this Murano paperweight with a label that has black on silver lettering and the prow design of a gondola. 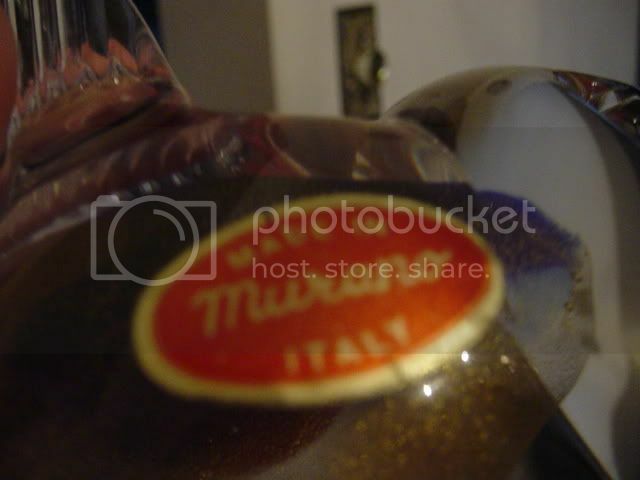 Reads: Made In Italy Murano Glass. It's a beautiful paperweight. The pink canes are especially vivid against the vibrant green glass. I have other Murano weights packed away in a box in a basement room that's going to be professionally decluttered in a week or so. Lots of boxes of books, posters, tools, etc. Can't wait to go through the two boxes that have paperweights. Anyway, here are images of the weight and its label. You have a Fratelli Toso paperweight! The F and T are fused to make that logo. Thanks so much for your reply Javier. It's a gorgeous paperweight. I'm pleased to know its a Fratelli & Toso. The logo (the fused F & T) IS supposed to look like the prow design on every gondola I saw in Venice, right?